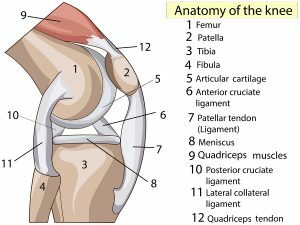 The anterior cruciate ligament (ACL) is one of four key ligaments of the knee joint. The ACL is located within the centre of the knee joint and connects the femur (thigh bone) to the tibia (shin bone). Ligaments are strong bands of connective tissue that connect bones for the purposes of stability and this is exactly what the ACL, along with the other knee ligaments, does within the knee joint. The ACL helps to prevent the forward translation of the tibia relative to the femur and also provides rotational stability to the knee. ACL injuries can occur for a number of reasons. From a biomechanical perspective, research shows that ACL injuries usually occur when the knee is near or in full extension and the trunk is rotating away from the knee. An athlete may find themselves in this compromised position when landing after jumping to catch a ball for example, or when suddenly changing direction to chase after the ball or an opponent. These are known as non-contact mechanisms of injury. However, an athlete participating in collision sports such as rugby or Gaelic football may also sustain an ACL injury as a result of a direct collision or impact to the knee, for example in a tackle. Who is at risk of an ACL injury? Given the mechanisms by which ACL injuries occur, athletes from sports such as football, basketball, rugby, netball and skiing are particularly susceptible. Generally speaking, any sport that involves high-level demands such as sudden change of direction, aggressive deceleration, jumping, landing or impact collisions will come with an inherent risk of ACL injury. 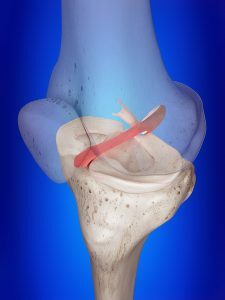 If you have sustained an ACL tear, you may have heard a “pop” in the knee and may have experienced the knee “giving way” when the injury occurred. This is usually followed by significant pain and swelling in the knee joint. Rapid onset of severe swelling in the knee is often a sign of ACL injury. On clinical examination, your physiotherapist will take a thorough history of how the injury occurred and will carry out a series of tests to help identify whether you have likely sustained an ACL injury. Where appropriate, your physiotherapist may refer you for an MRI scan to determine the extent of the injury. It is worth noting that your knee may begin to feel normal again relatively soon after the initial injury as the swelling and pain settles. However, this does not mean that the problem has resolved completely as the instability of the knee may remain. Depending on a number of factors including your age, previous injury history and level of functional activity, the option of surgery may need to be considered in order to restore knee stability. Traditionally, almost all athletes who sustain an ACL rupture have been recommended to undergo surgery, given the high-level demands they wish to return to. However, a decision to undergo surgery should never be trivialised, and it is worth noting that ACL tears can be managed conservatively. A famous case recently documented how an elite Premier League footballer conservatively managed an ACL tear, returning to play in just 8 weeks with no adverse effects on follow-up 18 months later (Weiler et al. 2015). This fact does not apply just to the elite, with research highlighting that the general population can also return to sport without surgery (Grindem et al. 2012). It is also worth noting that research shows that conservative management does not lead to increased risk of osteoarthritis in comparison to surgery (Filbay et al. 2017; van Yperen et al. 2018). If you have good knee stability and are able to compensate well after an ACL injury, it may be concluded that surgery is not required. However, should you choose to undergo surgical intervention the surgeon will perform an ACL reconstruction, generally using part of the hamstring tendon or patella tendon as a graft to reconstruct the ACL. What does ACL rehabilitation entail? It is critical to remember that ACL surgery is only half the battle in returning to pre-injury activity level and an extensive period of rehabilitation is required. Unfortunately, many ACL reconstruction patients fail to meet evidence-based guidelines particularly where rehabilitation is timeline-driven. This is why we at EBTC have adopted the evidence-based Melbourne ACL Rehabilitation Guide. This criteria-based protocol serves to ensure that athletes venture through rehabilitation in a logical and systematic manner and progress through each phase only when a series of tests determine their readiness to do so. Although the Melbourne Guide adopts a criteria-based as opposed to a timeline-based approach, patients rehabilitating after ACL surgery should expect at least 9-12 months of rehabilitation before considering a return to sport. Research demonstrates that returning to full sport before 9 months significantly increases the risk of re-injury (Grindem et al. 2016). Have a read of our web page on the Melbourne ACL Rehabilitation Guide to find out more information on this ACL rehabilitation pathway. If you would like to book an appointment with our specialist lower limb physiotherapist – Mark Durcan – you can call the clinic on 091 727777 or get in touch via the contact page.